Being a salesperson at most businesses today is an email-heavy job. Okay, maybe all jobs today are pretty heavy on the email — the average person spends 28% of work time reading and responding to email. But salespeople usually have it worse. In addition to keeping up with all of the internal emails flying around the office, salespeople have to stay in touch with dozens, if not hundreds, of leads. And that means reading and sending a mind-numbing amount of emails every single day. That’s the bad news. The good news is that we spend our own long days here at SaneBox working on solutions to your email problems. And we’ve got a bunch of tools that can make life a lot better for salespeople. Let’s start with the basics. If you’re in sales, there’s a good chance you spend a lot of your time sending follow-up emails. And there’s also a good chance you waste a lot of your time keeping track of all those follow-ups. Well, those days are over. With SaneBox’s follow-up reminders, we can let you know when an email you sent didn’t get a response by a certain time. It’s a wonderfully simple solution to an annoyingly big problem. And, if you’re anything like SaneBox’s other customers, you’ll probably also find that follow-up reminders can be a great way to send messages to your future self. But what about someone who has responded? We’ve all been there: you’re about to turn off your computer when four important emails suddenly pop-up in your inbox. You can’t respond right away, but you also can’t afford to let those emails get lost, especially if they’re important leads. No worries. 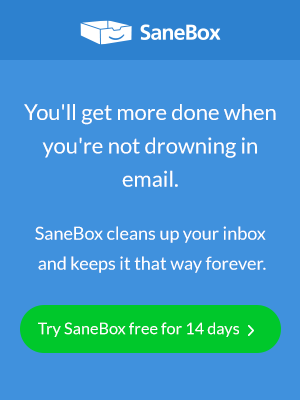 SaneBox allows you to defer an email until you’re ready to respond. Just place the email in the SaneTomorrow, SaneNextWeek or Custom Defer folder and SaneBox will put it right back in your Inbox when the right time comes. Progress, right? But the tools we’ve mentioned so far still leave us with a massive problem for many salespeople: to be productive, you’ve got to focus all of that following-up and responding energy on the right people. After all, some leads are much further along in the sales funnel than others. If you’re spending the same amount of time emailing with leads who aren’t likely to open their wallets as you are with more serious customers, you’re losing sales and money. Sure, some email solutions now allow you to categorize messages as “important.” But when you’re working with lots of different leads at different stages of the sales funnel, one “important” category isn’t going to cut it. To use your time as efficiently as possible, you need to make more subtle distinctions based on the specific stage the lead is in. And that’s why SaneBox offers up to 5 levels of importance. 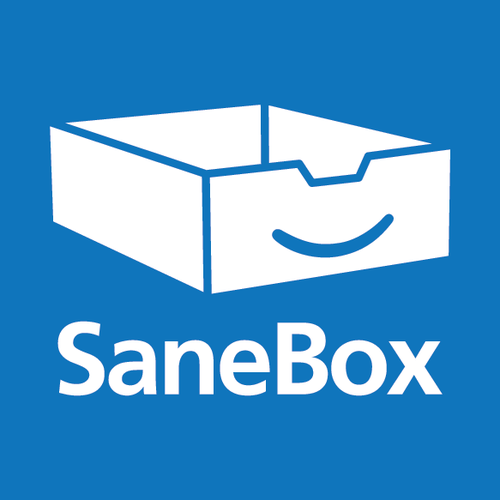 SaneBox also integrates with Salesforce so any leads or contacts from your Salesforce CRM will automatically be recognized as top priority in your inbox. To set this up, go to the Salesforce App Exchange page and find SaneBox. Next, click “get it now” and then “install from provider’s site”. This will redirect you to SaneBox’s website where you only have to type in your email address to complete the set up. What about the completely unimportant messages? If you never want to hear from a sender again, all you have to do is drag the email into the SaneBlackHole folder — it’s quicker and safer than going through an official “unsubscribe” process. And if you’re not ready to go that far, SaneBox’s smart and simple filtering algorithms can move unimportant messages out of your inbox and into a separate folder. We can even summarize unimportant messages for you, so that you never have to go through the trouble of reading them. Training an email to SaneBlackHole will train that contact to be filtered into your Trash folder. If the email is new (less than 7 days old), this email will stay in your SaneBlackHole folder for 7 days. Thus allowing you time to review to make sure you have not created an accidental training. Important. If that email was received 7 days ago and you move it to SaneBlackHole, it will automatically be filtered to your Trash folder that day. Oh, and speaking of summaries, if you’re emailing leads all day, your brain probably hurts by the time you’re done. You may not even remember the emails you sent in the morning. Enter the Sane Summary, a daily (or more often if you want) summary of your activity that allows you to process your latest unimportant emails, upcoming reminders, and more. Then there’s our Close the Deal feature, which actually does your job for you. Just kidding, we don’t have that, but the email management features we do offer can help you focus on important leads and be much more productive.